There were a handful [of soldiers] that my mother and dad knew as being Jewish soldiers, but who didn’t acknowledge it. And then there was the young group of guys in their late teens, maybe early twenties, who would just go there because there was a common room where you could just sit around and visit. You have to think back that there were no cars, there were no going to restaurants — there wasn’t anything outside of going to the Synagogue to meet up. And at the time, the majority of the Jewish community did live on that end of town. My mother was mostly in the kitchen. She would make soups, she would make pancakes, potato pancakes. There would be a variety of Jewish dishes, which consisted of let’s say cabbage rolls, sweet and sour meatballs, noodle puddings. And they worked long hours – my mother would be there at five o’clock in the morning for deliveries. Of milk, ice cream, ice, bread, which was delivered by horse and wagon. And my dad would come in later and get his meats prepared, and sharpen his knifes, and clean up, and before you know it, they were busy. He would drive up – they lived on York Street – and he’d get out of the car, and he’d be singing at the top of his lungs, in seventh heaven! And whatever I was doing, I stopped. The voice was inspiring. You could listen. And every Saturday afternoon he would come and we would listen to The Shadow on the radio in the kitchen, and then we would listen to the opera. I never understood a single word, of course. But here I was sitting on my uncle’s knee. My sister might be off someplace, so I didn’t have to be concerned about her. My brother might be helping in the front of the Delicatessen, so I wasn’t concerned about him. I was selfish; I was being pampered. Rosalyn and Estelle were twins, and Becky dressed them alike, which they resisted as they grew. They were very different from one another. While Rosalyn was usually happy to stay in the deli and help, Estelle tended to go off on her own. And my sister used to sing all the time. She didn’t have a voice, she had a lousy voice, actually. But she’d be driving along on her bicycle and she’d be singing. She’d be fishing, and she’d be singing. And in those days, you could catch a lot of eels off the causeway, and she used to sell them to the Chinese people because they liked them. In due course, Estelle moved to London England where she bought a pub, the Carpenters’ Arms. 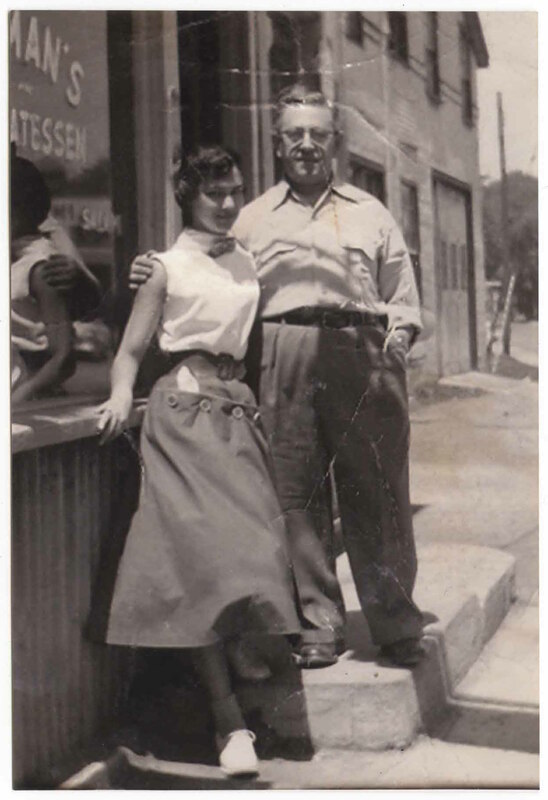 Rosalyn married a boy from down the street, Sid Routbard — in fact, his family ran a dry goods store on Montreal Street at Raglan. 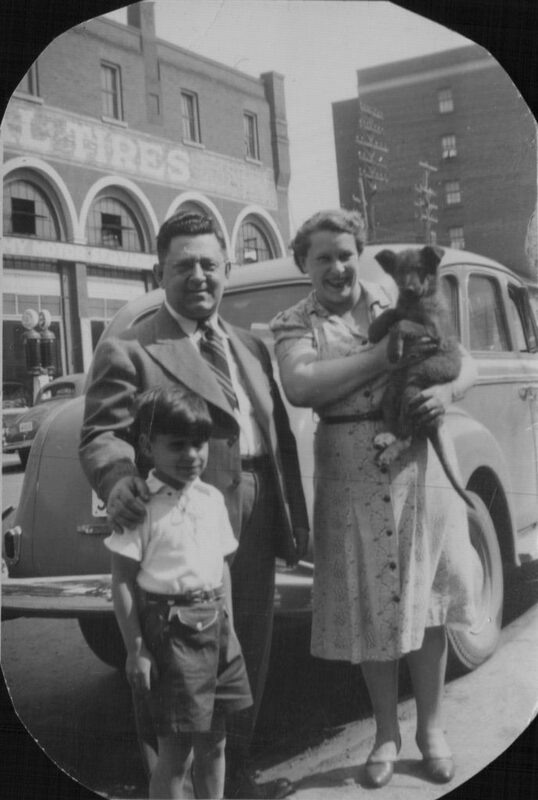 Sid, who was leader of the Sid Nelson Orchestra for a time, went on to work in the city’s Social Services office. 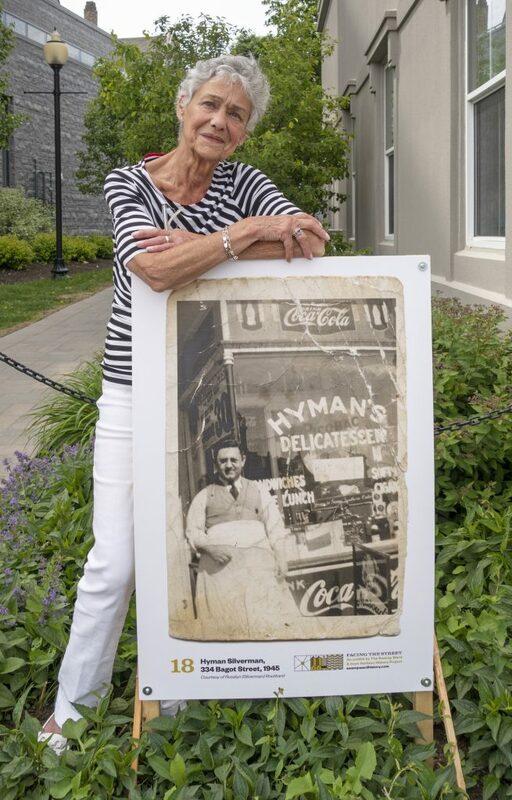 After the deli burned down in 1956, Hyman worked in the men’s suits section of S&R — a job he also loved — until he retired in 1977. Rosalyn still lives in Kingston and was glad to be reunited with her father and with the deli through Facing the Street. For more on the Silvermans, see this blog post and listen to this episode of Stories of the Swamp Ward. Warm thanks to Rosalyn Routbard for photos and stories.